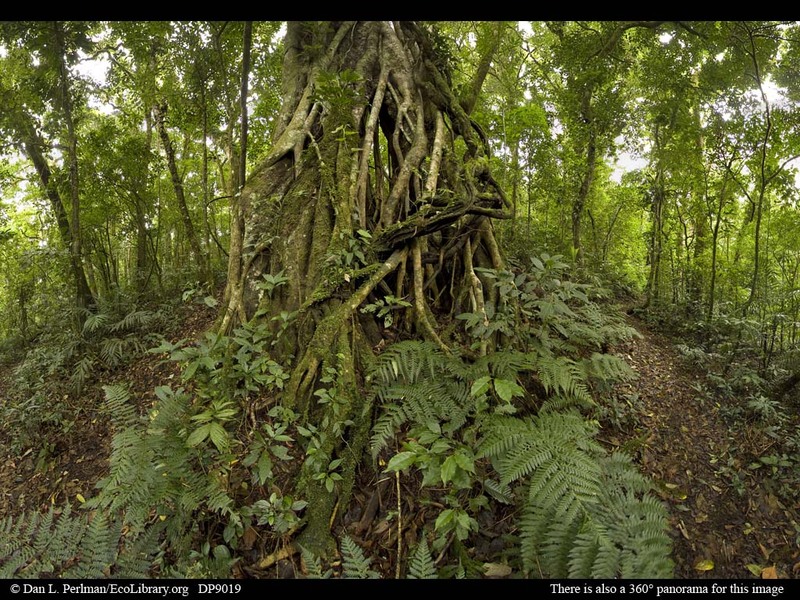 You may want to discuss with your students the costs and benefits of the strangler fig's strategy of growing very tall without investing a great deal of energy in building a massive trunk. It is interesting to compare this suite of adaptations with those of giant redwood trees or non-strangler tropical fig trees. Strangler fig trees, such as this one, typically begin life as a seed deposited high in the branches of a host tree. The fig's roots grow down to the ground, encircling the host. Eventually, the fig grows taller than the host and outcompetes it for light (and possibly for water and nutrients) so that the host dies. Over time, the host tree rots away entirely, leaving behind the hollow cylinder of the living fig's roots, as seen here.